This interior painting project was completed with a very particular goal in mind: crisp, sharp lines. Prior to painting this home in Fort Collins, the color was a neutral gray with Dover White trim and doors and it was consistent throughout the entire interior. This is a new home in the Bucking Horse subdivision. The walls have a common knockdown texture on the drywall. 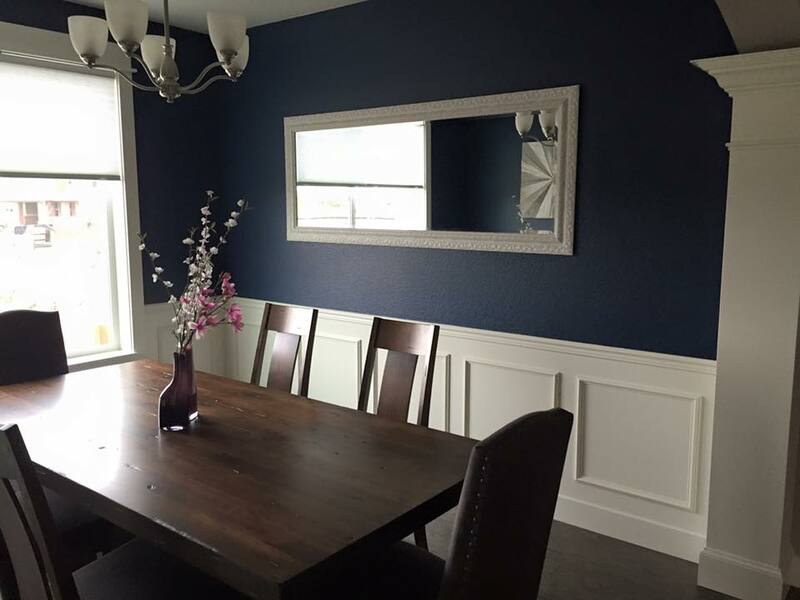 The owners wanted to keep the white wainscoting and accent the color above to create a bit of a classic or traditional feel in this formal dining room. We tried some reds, dark greens and ultimately settled on this blue, called Naval from Sherwin-Williams. Once the color was decided, the careful preparation of taping ensued. Our painters applied two coats of a Zero-VOC paint in an eggshell finish. After the tape was carefully, removed, it was a wrap! The project was a success!